It didn’t look like the Pittsburgh Steelers would have the defense to make it to the Super Bowl at first. But 2015 first-round pick Bud Dupree has changed that. The Pittsburgh Steelers made a solid pick, taking Bud Dupree in the first round of the 2015 NFL Draft. And in his rookie year, the team decided to bring him along slowly. Dupree had only four starts and showed flashes with four sacks in 2015. That burst off the edge with bulldozing power is just what the Steelers need to rebuild their Steel Curtain. The team’s offense already has what it takes to go to the Super Bowl and win it. But Early in the year, it didn’t look like the Steelers were going far at all. They were 4-5 in their first nine games because the defense couldn’t stop anyone. And yes, getting after opposing quarterbacks was one of the main problems they were having. That’s because they were without Dupree, who had an abdominal injury. The Steelers gave up almost 24 points and 300 passing yards per game while averaging only 1.4 sacks. Then they get Dupree back and the defense changes, leading to better overall results. In the last seven regular season games, the Steelers didn’t lose. They gave up only 17 points and 195 passing yards per game, while averaging three sacks. He even got old veteran James Harrison going as he doesn’t see as many double and triple-teams. Here in the playoffs and Dupree is still making a difference. In the Wildcard Round, they avenged their loss to the Miami Dolphins 30-12. Dupree had a half a sack and two quarterback hits as the Steelers had five sacks and nine quarterback hits. 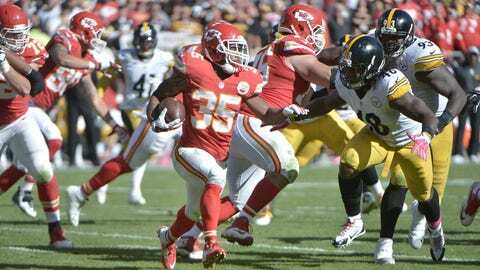 The Steelers defense continued on against Kansas City Chiefs in the Divisional Round. Dupree had one of the Steelers five quarterbacks hits as Harrison had two of them along with a sack. Harrison had the only Steelers sack because Chiefs quarterback Alex Smith got rid of the ball quickly. But the Steelers will take that because Smith only averaged 5.1 yards per attempt. This bodes well for the Steelers because Tom Brady showed he is still vulnerable if you can get after him. Dupree and the Steelers defense is coming around just in time for Brady. And because of that, here is no guarantee that the New England Patriots will make Super Bowl 51. Ben Roethlisberger is playing this time!